If you have significant counter space in your kitchen then you may find that it casts unsightly shadows and leaves dark areas along the lower portions of the room. This is especially the case if you’ve added under cabinet lighting fixtures to provide light while working on countertops, or if you’ve installed recessed lights or sources of illumination above tables, breakfast nooks, bars, or center islands. Light is the element that brings out details such as color, texture, and pattern as well as providing a warm glow to set moods and illumination to see the things you want to do. Therefore, building layers of light in your kitchen works to accentuate its beauty and cast a radiance that welcomes and comforts. The solution for eliminating such shadowing as well as adding beauty to your kitchen is to install under the counter lighting. However, although there are numerous benefits to such lighting, there are also some issues which need to be considered lest they cause problems. 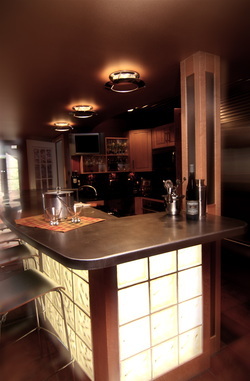 There are several types of fixtures that can be used for underneath counters. Each one offers its own unique supply of lighting, but also has its own ability to be problematic. Puck Lights – Puck lights get their name from being shaped like hockey pucks and normally come in diameters of 4, 5, and 6 inches. These lights provide a nice beam of light downwards and, therefore, are mainly used to illuminate task areas or to highlight objects. Some puck units are designed to swivel so that light can be angled in different directions. However, puck lights may be too bright for under counter lighting purposes as well as presenting some other problems. Puck units are designed to either be installed directly to a surface or to be recessed into a surface. Recessed puck lights are quite popular for meeting home lighting needs, but you will not be able to recess them into countertops in most cases due to the thin nature of the countertop or to it being made of granite or other hard substance. Units that are installed directly to the underside of the counter could present a bump or snag problem, especially if you sit with your legs under it. If you decide to use puck fixtures for under the counter light, you should stick with the smallest options you can find. Not only will this help to reduce accidental contact, but smaller units provide less light which is better for under the counter lighting purposes. Strip Lights – Strip light units are narrow and come in various lengths. They are commonly used as undercabinet lighting sources because they can be easily installed to the undersides of overhead cabinets to provide light for working. Strip lights are good choices for under the counter lighting needs. You can purchase strips narrow enough to eliminate any accidental contact as long as the strips are installed against the back side of where the counter meets the support wall. Strip lights come with various bulb options and can be hooked to dimmers which make them ideal for providing controllable under counter light. Rope Lights – Rope lights are probably the best source of under the counter lighting because they provide a warm glow that isn’t too bright. Rope lights are also very easy to install as they come in rope-like rolls that can be cut to length and they are also flexible so they can be wrapped around curves and corners. When planning on which type of under the counter lighting fixtures you want to use for your project, you must also consider the types of bulbs used. The reason is that some types of bulbs burn very hot so they could make your countertop uncomfortable and cause a burn hazard to legs, children, or pets. Avoid using units containing either halogen or xenon bulbs for under the counter lighting as they both burn quite hot. Although halogen and xenon provide the best color enhancement, they both are also high energy burners and have a fairly short burn life (approximately 2,000 hours each). Instead, stick with either fluorescent or LED bulbs as they are both cool burning, are high in energy efficiency, and last quite a long time. LED bulbs are the best choice for under the counter lighting projects because they put off practically no heat, are the best energy users, and last the longest (50,000 hours compared to 10,000 hours for fluorescents).